Self discipline is a personality trait that the spontaneous subliminal messages, which you automatically pick up from your environment, ingrain in your personality in your very early childhood. Once you have developed a personality trait in such a manner through growing up the way you did, it becomes almost impossible to change the same by ordinary means of resolutions and determination at the conscious level later in life. And if, unluckily, you happened to lack the said trait of discipline in your mental disposition as it was acquiring shape; you are almost doomed to live your entire life in an undisciplined way. You have to pay the price for the lack of discipline in your actions in life! Unfortunately, the price to be paid is a bit too high!! You pay for it with FAILURE in your projects, whether professional or personal!!! Is there a way out to undo the wrong done to your mental disposition in the growing phase of your personality-forming years, learning self discipline now? How to develop self discipline at this juncture of your life? Remember, determination and resolutions at the conscious level just do not work. What works is the subconscious tendency of the mind. Can the subconscious tendency be changed at this present juncture in your life? Subliminal messages have this power to re-do your personality traits at the deepest level of your subconscious self that simply cannot be addressed by any conscious means of resolution, determination or persuasion. These subliminal messages simply get embedded in the depth of your subconscious; and as they keep getting strengthened over there as the positive traits of self discipline in your basic nature, they automatically drive the negative chaotic traits ingrained during the personality forming years in your childhood, OUT. 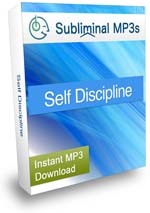 If you haven’t tried Self Discipline Subliminal yet then the time has come for you to undo the wrong done to your personality in the growing years of your life, now. 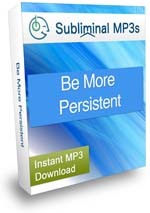 And if you want to strengthen discipline with persistence along, you can try Be More Persistent Subliminal as well!